Sharpie Fine Point Metallic Markers SAN39109PP $6.41 Permanent ink is fast drying, quick flowing and water resistant. 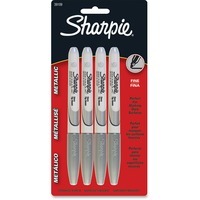 Metallic Sharpie marker features a tough, resilient 0.5mm tip. Durable fine point does not fray. Certified AP nontoxic ink is ideal for marking on dark colored materials.